Cardiovascular diseases, such as thrombosis and stroke, represent the major cause of disability and death worldwide; and dysfunctions in platelet aggregation and blood coagulation processes are involved. The regular antithrombotic drugs have unsatisfactory results and may produce side effects. Therefore, alternative therapies have been extensively investigated. 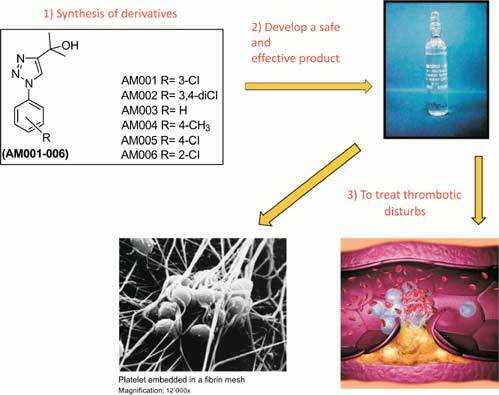 Objective: The anticoagulant and antiplatelet aggregation potential of a series of six synthetic 1,2,3-triazole derivatives were investigated through in vitro models. Methods: Coagulation tests included the prothrombin time (PT), activated partial thromboplastin time (APTT) and thrombin time (TT) assays, and were performed on a multichannel coagulometer, using human plasma. The platelet aggregation assays were carried out using human platelet-rich-plasma (PRP). Aggregation was initiated by adding ADP or collagen and monitored turbidimetrically on a Whole Blood Aggregometer. Toxicity of derivatives was evaluated on platelets and red blood cells, by measuring the release of lactate dehydrogenase and hemoglobin, respectively. Moreover, theoretical toxicity of derivatives was calculated using the software Osiris® Property Explorer. Results: All the six derivatives tested inhibited, but with different potencies, the plasma coagulation assessed by the PT and TT assays, and also inhibited platelet aggregation of PRP induced by collagen or ADP. The derivatives did not interfere in the aPTT assay and did not affect the viability of platelets or red blood cells. Theoretical studies also revealed that all derivatives will likely to have low toxicity, great pharmacological and oral bioavailability profiles, and a Druglikeness and Drug score similar to some commercial anticoagulant and antiplatelet drugs. Conclusion: 1,2,3-triazoles are potential candidates for molecular modeling of new antithrombotic drugs. Anticoagulation, antiplatelet, Lipinski rule-of-five, theoretical toxicity, thrombosis, triazoles. Department of Cellular and Molecular Biology, Institute of Biology, Federal Fluminense University, CEP 24020-141, Niterói, RJ, Brazil.